Ecosmarte - the best chemical removal technology for city water. Today’s water treatment methods rely on chemical disinfectants to prevent water borne diseases from becoming epidemic health problems. ‍Chlorination (the primary water treatment chemical) has shown its ability to control the many water borne infectious diseases, such as cholera, typhus and dysentery, which could other wise run rampant. Since its introduction into water treatment, chlorination has become almost the sole method used for active disinfection of water. This predominant position has been gained because of the recognized potency and acceptance of chlorine as a germicide by public health authorities. Chlorination and chemical control of simple biological organisms have proven useful and essential but we are learning the price we pay for the benefits of chemical control. The side effects of chlorine, bromine, aluminum, phosphates, chromates, etc. cause adverse effects on human health and the health of our world environment. ECOsmarte Point-of-Entry systems dramatically improve the quality of water by filtering out 99.5% of the chlorine, ammonia and other chemicals that may be added to the water by municipal water companies to sanitize the water. Once the water is stripped of these chemicals, it is sanitized in a chemical-free manner through the use of copper ionization. The water is also oxidized in the process. In addition to sanitizing the water, the ECOsmarte system protects your plumbing and plumbing fixtures by preventing minerals from forming hard scale. Scale build-up is one of the most common causes of failure of hot water heaters and dishwashing machines. The ECOsmarte Point-of-Entry system not only provides bottled water quality throughout your house, hot and cold, inside and out, it also increases the life of your appliances, including your hot water heater, diswashing machine, coffee maker and ice maker. The municipal Point-of-Entry system includes one water tank with an electronic control head, two bags of filter media, an electronic controller and an ionization/oxidation chamber and requires 2-4 hours to install. The system takes up less space than a water softener and brine tank. Do you have a townhome, diesel pusher or freshwater yacht? Our zero back wash system might be the right choice for you. 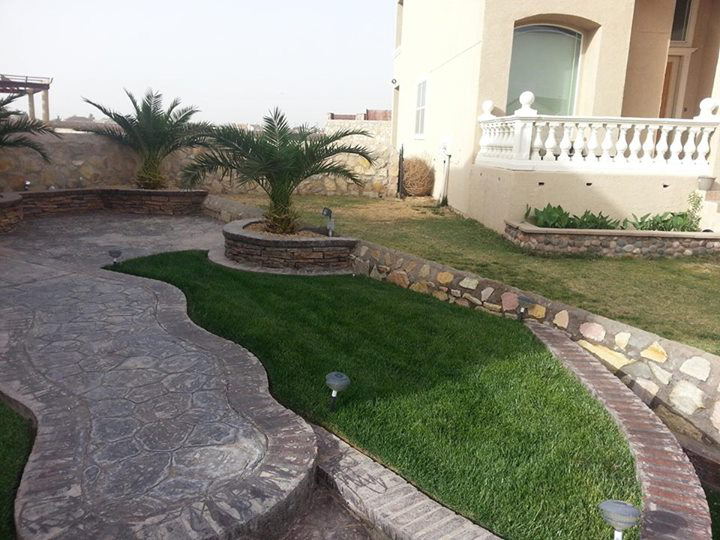 The yard to the right is using regular El Paso city water, the "wetter" water to the left is oxygenated and ionized with ECOsmarte's whole house water system. You not only achieve the "greener" grass look, but you also use one half of the water your neighbors do. No impact on budget, high impact on curb appeal. Of course the BOTTLED MINERAL WATER to every faucet is the reason most people purchase ECOsmarte Whole House Systems. Hot and cold, indoor and outdoor. A low operating cost of $400 for three years on city water and $700 for three years on well water. You Can Have “Bottled Water” Quality, throughout your house, hot and cold, inside and out. The ECOsmarte Point-of-Entry product line brings state-of-the-art electronic ionization, chemical-free, titanium oxidation and multimedia filtration into the residential water market. This breakthrough, ECOsafe technology, creates a new standard in water quality. The ECOsmarte Point-of-Entry system replaces water softeners, iron filters, chemical feeders, taste and odor filters and other water treatment methods. The ECOsmarte system reduces or eliminates odors, tastes, coloration, staining and scaling caused by source water. It also creates premium water quality while still preserving the copper, calcium and magnesium minerals that are vital to your health. Unlike some water treatment systems, the ECOsmarte system is not limited in the amount of water it can treat and it does not restrict, limit or otherwise reduce the supply of water available. 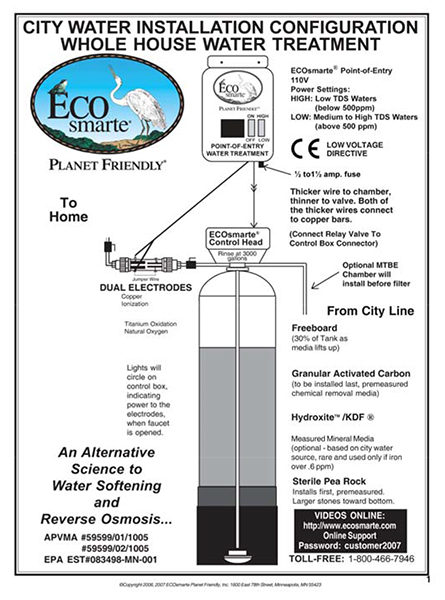 ECOsmarte ionization and oxygenation protects your plumbing and fixtures. Ionization prevents minerals from forming hard scale by electrically charging the minerals so they cannot bind together. The Point-of-Entry system converts the calcium to calcium bicarbonate to keep it soft. The system dissolves the existing scale in your pipes, water heater, appliances and plumbing fixtures. The greatest cause of plumbing equipment and appliance failure are problems caused by scale and corrosion. With the ECOsmarte system, these problems are eliminated, reducing maintenance and prolonging the life of appliances as small as coffee makers and as large as dishwashers and water heaters.The ECOsmarte Point-of-Entry systems create charged particles called ions. Mineral ions are safe and essential for humans, plants and animals but are lethal to bacteria, algae and some viruses. The mineral ions stop bacteria and algae from colonizing in your plumbing when water is not in use. The ECOsmarte copper ionization process is recognized by the US EPA to provide numerous microbial benefits.The ECOsmarte Point-of-Entry systems produce a quality and volume of water at a cost not obtainable with a reverse osmosis system. The systems also provide bacterial protection that no water softener can deliver and unlike reverse osmosis systems, it does not remove the minerals that are necessary for your health. It treats all of your water, hot and cold, indoor and outdoor with no consumables and minimal maintenance for at least three years. Own a Town Home, Diesel Pusher or Yacht? ECOsmarte Point-of-Entry Systems can be installed by a handy homeowner or a licensed plumber. Installation normally takes 2-4 hours.Systems should be installed where the water service enters the home or facility. The system needs to be housed so that it is protected from freezing temperatures. The systems require 110 volt electrical service and a means to dispose of waste water from periodic backwashing of the filter media. A minimum water flow of 11 GPM is necessary to adequately clean the filter media during the backwash cycle. The water discharged during backwashing is not harmful to the environment and can be discharged onto a lawn or into the sewer.ECOsmarte can arrange for installation by a licensed plumber in most North American markets. ECOsmarte Point-of-Entry systems are totally automated and require no work or assistance to operate properly.Most of the maintenance is also automated. The filter media automatically backwashes periodically based on programmable settings. The ECOsmarte filter media has a life span of 5-7 years. The cost of replacing the filter media is approximately $300. Changing of the filter media can be performed by the homeowner or we can do it for you by simply supplying you with a new filter tank already charged with new filter media. The ECOsmarte ionization chamber does need to be cleaned two to three times per year. The chamber can be removed by hand, cleaned and replaced in less than 10 minutes. Copper electrodes in the chamber also have a life span of 5-7 years and cost $175 to replace. The ECOsmarte system requires no chemicals or salt to be added or filters to be replaced. It is as maintenance free as a total home water treatment system can be. Absolutely. The amount of copper added to your water is just enough to sanitize the water from the possibility of bacteria colonizing in the water. If you were to drink two gallons of water from your home system in a day, you would ingest less copper than what you would receive by taking a multiple vitamin. Q: How does the ECOsmarte Point-of-Entry System work? As water enters the filtering tanks, the contaminants and chemicals, including chlorine, in your water are filtered out. Then your water receives copper ions as it passes through the ionization chamber. The purpose of the copper ions is to provide residual bacterial protection in your waterlines so no bacteria can contaminant your water even if your water is not used very often. Q: Is the system easy to install? Yes, either the mechanically-inclined homeowner or a licensed plumber can typically install the system in 2-4 hours. ECOsmarte can also arrange for the system to be installed by a licensed plumber in most markets in North America, Mexico, Norway, Sweden, Spain and Asia Pacific. Q: Is the system easy to operate and maintain? Yes. As mentioned in the installation and operation sections, there is nothing for you to do for the system to operate properly. The filter media backwash automatically based on a schedule programmed into the Osmonic controller. The only maintenance you will need to perform is to clean the ionization chamber a couple of times each year. The chamber can be removed without the use of any tools and can be cleaned in less than 15 minutes. Q: What are the annual costs to operate the ECOsmarte Point-of-Entry System? There are no annual costs to operate the system. Every 5-7 years, the filter media and the copper bars in the ionization chamber need to be replaced. The filter media can be purchased for about $400 and replacement copper bars cost $175. ECOsmarte has been installing water treatment systems for over 15 years. We have over 20,000 installations worldwide. 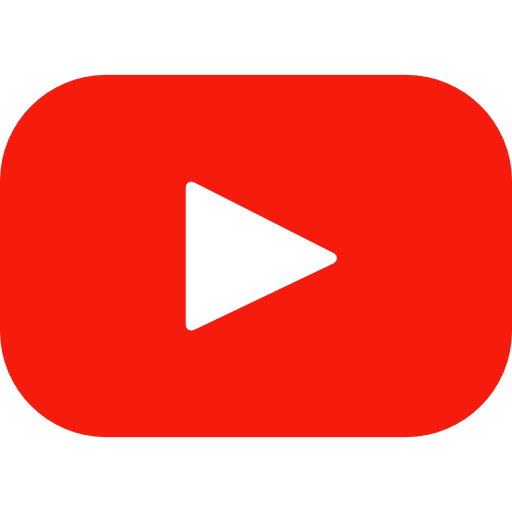 Until the last few years, we have marketed products primarily over the internet. Recently we have begun building a worldwide network of distributors, dealers and resellers. We currently have over 300 dealers in North America and the network is growing every year. Our network of factory trained installers now exceeds 1000. Q: Why should I purchase an ECOsmarte Point-of-Entry System instead of a reverse osmosis system? Reverse osmosis system are very expensive for treating all of the water in your house. The membranes have a very limited life and are expensive to replace. By using a reverse osmosis system for your whole house, you are filtering out the chlorine and other chemicals used for residual bacterial protection and the water in your plumbing lines will not be protected from bacterial colonization. Small reverse osmosis systems may be necessary to filter out certain materials such as sodium and fluoride from drinking water but are really not practical or cost effective for treating an entire house. 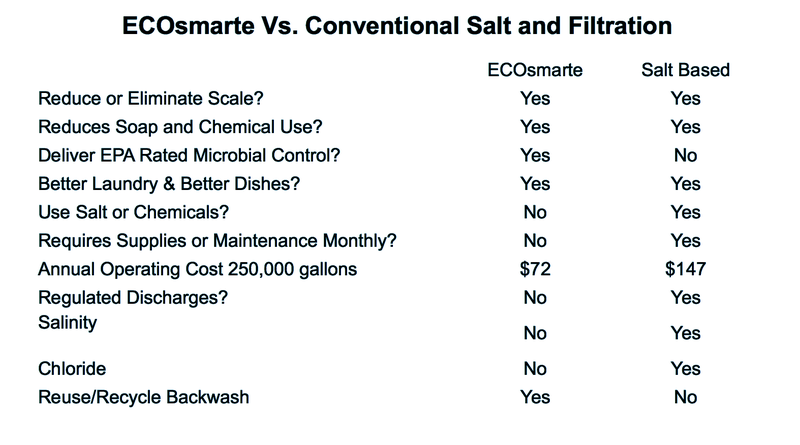 Q: How does the ECOsmarte system differ from water softeners sold by companies like Culligan, Sears and Home Depot? Most water softeners sold by the companies mentioned add salt to your water so that the water will feel softer and reduce the scaling of the calcium. The salt is usually purchased in 50 lb. bags and needs to be added to the equipment on a regular basis. Installing a water filter and softener will not remove any chemical or prevent future contamination in the plumbing, the brine tanks or the water lines of your house. Q: Our water smells like rotten eggs and causes orange stains on everything it touches including our clothing. Will the ECOsmarte system correct these problems? Yes. After our technicians review the results of the water samples they receive from NTL, they will know the exact levels of each contaminant in your water. They will engineer your system with whatever filters are necessary to insure every problem with your water is addressed. In the unlikely event that your water contains contaminants that cannot be fully filtered out of the water, you will be immediately notified and you will have the option of receiving a complete refund. It is unlikely that this will happen but it is a possibility we feel you should know about. You can call us at 612-866-1200 and we will gladly answer any questions you may have. We are on central standard time 8:00am to 6:00pm CST Monday through Friday and 9:00am to 1:00pm on Saturdays.